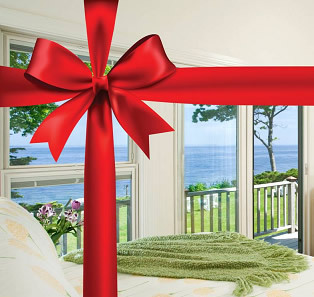 Voted Comfiest B&B on the CT Shoreline for 8 years in a row. A gem in the heart of the CT Shoreline. The Tidewater Inn, Madison CT Overlooking the Boston Post Road, in a wooded residential area in the heart of the Connecticut shoreline, is a classic romantic bed and breakfast inn named the Tidewater. The Inn is within walking distance of the village of Madison and less than one mile from the nearest beach. Here you’ll experience gracious hospitality in a relaxed setting. It is the perfect place to escape to. Our large shaded back yard slopes down to meet Fence Creek. The tidal wetlands of Long Island Sound are visible across the road in the front. A rocking chair and love seat on the front porch welcome you and invite you to sit and relax. The “Shoreline Times” Readers’ Poll voted our Tidewater Inn to be the Shoreline’s Comfiest B&B for eight years in a row, and one of the most authentic New England inns on the Shoreline. Our English garden, with its park benches and umbrella table, is a favorite spot to enjoy the symphony of birdsong, read, write, converse, reflect, linger over morning coffee or tea or an early evening glass of wine, and watch the world go by. Its trellised arches of climbing hydrangeas are perfect “photo spots,” and more than one couple has fallen under its romantic spell, walking hand in hand, enjoying a hug, stealing a kiss, proposing… Magnificent old Oak trees and a gracefully mature Weeping Cherry provide shade and solitude in the sloping back yard. Claim your spot on a bench for a nice long read or relax under the trees in our hammock for an extra nap. Inside, the Inn offers a comfortable and elegant atmosphere of antiques and estate furniture. The beamed sitting room has a large fireplace surrounded by comfortable furniture where guests enjoy the morning newspaper with their first cup of coffee, warmed by the sunshine coming through the front bay window, or gather fireside, to enjoy early evening refreshments, read over the inn’s collection of menus and chat with each other and the innkeeper to make dinner plans. Guests enjoy a full breakfast each morning, in our lovely dining room overlooking the gardens on three sides. The adjoining deck invites outdoor dining too. Each guest room is elegantly furnished with its own unique character, combining creature comforts with modern conveniences. Most rooms have a canopy or four-poster bed. Two first floor guest rooms have working fireplaces, and in winter we’ll supply the logs for you to enjoy. The Curtis Cottage is a beautiful hide-away complete with a sitting room, king bed in the bedroom, spacious bathroom with Jacuzzi for two, and private patio. The beautiful seaside village of Madison, mid-way between Manhattan and Boston, offers many opportunities for relaxing, pursuing special interests or satisfying your sense of adventure. Enjoy fine dining, from beach casual to special occasion elegance. Take in outstanding regional theater, art cinema, antiques, unique boutiques and outlet shopping. Golf by the sea, kayak, bike, hike or walk the nature trails. Explore colonial seaside villages, craft and fine art galleries, art and artists. Learn to sail, cruise the Sound, tour vineyards, lighthouses and islands. Don’t forget castles and trains and beaches and birds. Oh, and Winter sports too! The Inn’s collection of maps, menus and brochures provides a good starting place as you decide how to spend each day, and the innkeeper and your fellow guests will share insiders’ tips on where to go and what to do. You’ll run out of time before you run out of things to do. Once you’ve come, we’ll welcome you back again and again. Children Policies: We welcome children age 12 years old and older. Pet Policies: One small dog is welcome, with its crate, in our separate Curtis Cottage. Pets are not permitted anywhere inside the inn. On-duty service dogs always welcome.